Our sailboat had an anchor roller, chocks on the toerail, and a winch. It was the work of a moment to flip the rode off the roller, drop it into the chock and cleat it off. Revel has a roller, a substantial bitt, a winch, a pair of hawse holes with those weird cleat-lets. There's no flipping the rode off the roller and easily dropping it through the hawse and cleating it off. Our roller clearly is not up to the task of resisting lateral loads; it's bent, the roller itself is too short for the distance between the jaws of the bracket, the pin/axle is rusty and thus suspect. What's the trick? In no air, I suppose I could cleat the rode off to the bitt, then fiddle around with a bight of rode and pass it into one hawse, cleat it off and cast off the bitt. We're on an Annapolis Harbor mooring, hanging to one hawse and cleat. I took two lengths of 1/2" nylon three strand and splice and eye with a thimble in the end of each. Then I have done 1 of two things, both work depending on the situation. In one case I took a length of 5/8" braid with a thimble eye at one end and simply a whipped end at the other. After the anchor is down and set, I would use a rolling hitch to tie off the 5/8" braid to the chain road and use a soft shackle to shackle the three thimbles together, and then each run each 3-strand line through a hawse hole and you have a cheap, secure bridle. I also have found that using a Shockles Linegrabber around the chain then using a soft shackle to attached the 2 3-strand lines is even easier and quicker. I use this unless I am expecting more wind then I will use the 5/8" braid and rolling hitch as above. A well sized Hawse Hole to hold the anchor,, if well rounded does not require a roller. Simply locate the windlass so it can haul from either side , and enjoy the simplicity. A hull mounted cleat close to the H hole works well as the amount of line between the hole and the cleat is so short there is no line stretch to wear. I'd suspect those hawse holes/cleat-let thingies (very descriptive!) are only meant for bow lines, or for lines on/to mooring pennants. Probably not envisioned as having anything to do with anchoring with your own tackle. For a mooring ball, maybe a bridle attached to the pennant and the two cleat-lets? 3- search the forum for SNUBBER for other ways. Probably not envisioned as having anything to do with anchoring with your own tackle. 2- make a bridle to go from both hawse holes to a chain hook. Ah. Yep, bridle from each side hawse to main rode. I should have said that, too. I've since anchored twice by the pass-the-rode-through-the-hawse method. Not that tough! If this Rum and Tonic weren't so good, I'd go forward and add a rolling hitch on a bit of line to the rode and run it to the other hawse. Interestingly, and yet something else to fix!, the bowsprit is not anchored down to the rail cap (or anything else). The anchor came to the roller upside down and when I pulled on it, the bowsprit lifted. I was not using the winch, since the wench had not lowcrawled to the head of her bed to turn it on. Eventually, that sounds like a good application for a solenoid with a switch by the helm. Like he said. Then when going out, you leave the bridle in place, with chain hook fixed to something convenient so out of the way until needed. No biggie. I don't have a hawse hole each side of the bow, so just do High Wire's no.1 trick, but with a chain hook and length of nylon so the rode attachment point is just below the water surface, with the snubbing nylon line coming in over a second roller beside the main, so as to keep it away from the main chain rode altogether, (or if the weather is really serious, I have the snubber line with anti-chafe tubing over it set down between those two rollers onto the pulpit end), and I tie the snubber off on the very substantial Samson post - such as you also have. However, if you use the bridle through the hawse holes, then cleating them there makes sense to avoid stretching and chafing, as FF alluded to, even though it would be tempting to use that nice strong stainless (mine's wood), Samson post. Or, for simplicity, just use the single snubber like I do, and install some form of metal snubber guide/channel to prevent chafe at the end of the pulpit next to the main roller, and tie off to the Sampson post, but I'd do something about bolting the end of the pulpit down to the hull, for sure. "Or, for simplicity, just use the single snubber like I do, and install some form of metal snubber guide/channel to prevent chafe at the end of the pulpit next to the main roller, and tie off to the Sampson post,"
For some plan B is a very secure fitting about a foot above thev WL. 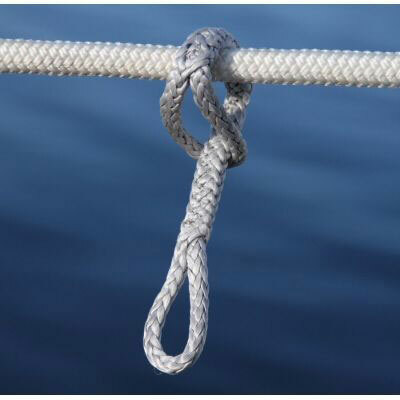 A pair if snubbers can be attached ( one thick, one thinner) with the hook or snap hook lead to the fore deck. Advantage no chafe and a much lower attachment , reducing scope requirements.